Decorating a house is an important part of making your home feel like, well, your home. When kids come into the picture, it gets harder to keep your home looking as nice and stylish as it once was. We have a secret to tell you: There’s no need to sacrifice having a fantastic looking home just because of the little ones. 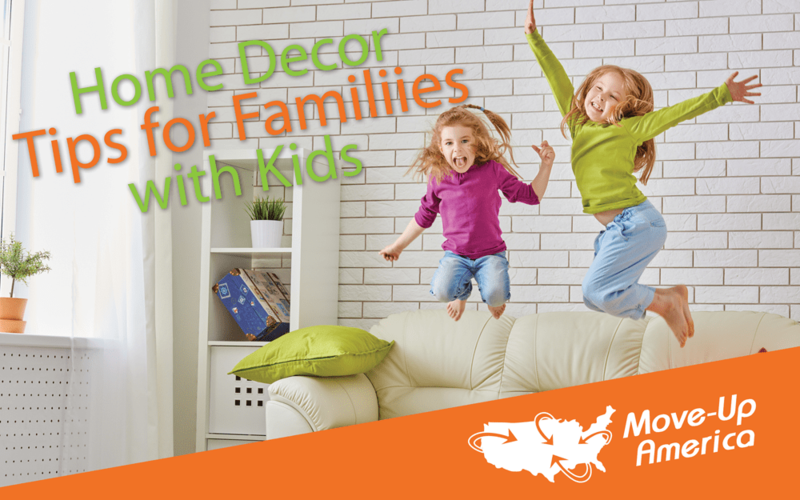 There are several ways to make any room look stunning while still keeping it kid-friendly! We’ve picked out some of our favorites to give you an idea of how to decorate your home while keeping those loveable mess-makers in mind. If you’ve got a toddler wandering around, too-high seating areas and pointy edges might be a cause for concern. Considering replacing it with poufs or even a storage ottoman. These will be easier on the little one if any accidents happen. As your toddler grows, the poufs can provide extra seating for them and any playmates they might have over, freeing up couch space for the adults. And a storage ottoman can be great for quickly clearing toys off the living room floor before guests arrive. Poufs and ottomans are easy to move around, and can make great accent pieces to any room. If you’re a DIY kind of person, you can take your old, rectangular coffee table and turn it into an ottoman with this handy guide! Outdoor rugs are incredibly easy to clean, but they don’t just have to be kept outside. Find one that’s stylish to add a nice touch to your dining or living room. When the kids get messy during meal time or rowdy at play time, your floors will be protected and you don’t have to worry about an expensive rug being ruined! These are also great to throw down in other high-traffic areas of your home, in case of muddy footprints or spilled drinks while your family moves about.